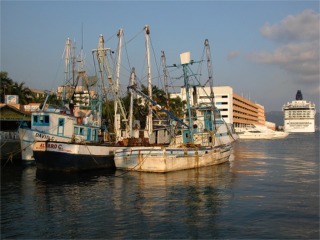 click photo to enlarge This is a couple of fishing boats along Acapulco Bay. In the background is our cruise ship the Norwegian Star. 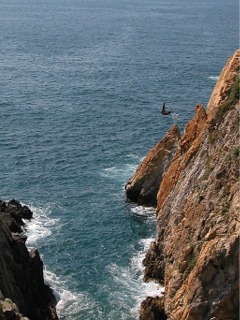 click photo to enlarge One of the first places we stopped was at the famous Acapulco Cliff Divers. They only do the dives a few times a day but of course if you are on a bus tour it's not a problem. They wait for the buses. 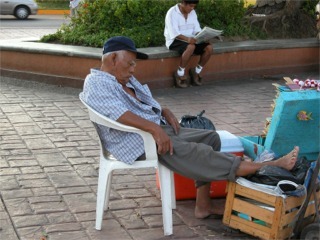 It is one of the things everybody thinks of when they think of Acapulco. click photo to enlarge This is part of the show they put on by the Cliff Divers. A short very colorful show of Mexican Folkloric dancing. click photo to enlarge This fellow had a long day selling bait by the shore. You can see his display of bobbers and some minnows on the ground around him he had been selling out of his cooler. 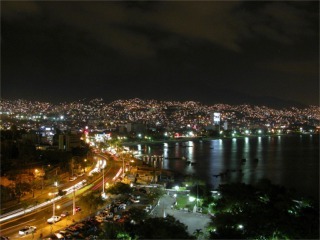 click photo to enlarge Acapulco is very pretty by the night lights. 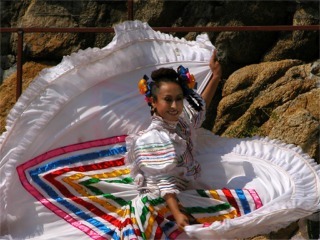 There is also a slide show on this web site of Acapulco. It is 11 meg in length.